I had a huge windfall . . . of the squash variety! And this isn't all of it . . . I have three more on the porch with the pumpkins. The one in front is over a foot and a half long. 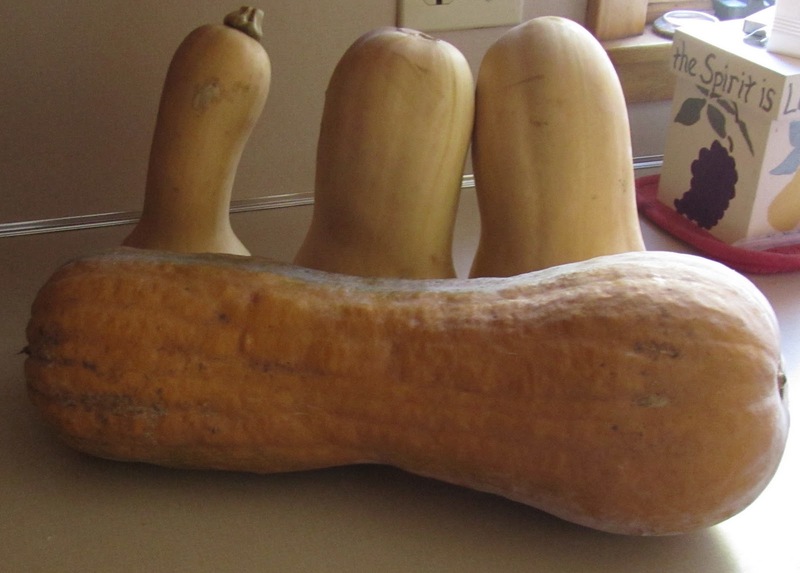 What on earth am I going to do with my squash windfall? My daughters want us to make a squash family - mom, dad, sisters. So that takes care of four of them, but what am I going to do with the ginormous one and the two other normal-sized ones? Do you have any great squash recipes? Help wanted! You can bake them in the microwave or oven and use the insides in any recipe that calls for pumpkin! I make squash ravioli! This is one meal that is so good that my husband lets me get away with not having meat in it! There are two types on that post. The butternut squash is my favorite! Boil, mash, add butter, salt and brown sugar. It is the best!! Also, you can make sweet potato pie with butternut squash. Add cubes of peeled squash to chicken soup. Cook until soft. Boil and puree' and add to any soup for thickener. It is not creamy thick, it is just more hardy. For more savory flavor cook chunks in with your Sunday roast along with potatoes. Roast chunks in the oven with a drizzle of olive oil, some salt and some fresh herbs sprinkled on. You can shred it raw (or cook and mash or puree) and freeze it for later. I often throw bits of pumpkin, squash and zucchini into pasta sauce, chili, cakes, loaves, muffins for extra nutrition. Muffins, pancakes, quick breads, I would love to have that much squash!